As you may have noticed from some of our bio's, we all have a special affection for some local business we grew up with. 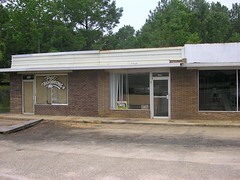 Daphne Pharmacy was one of mine. I started working there when I was in 8th grade, maybe 7th as a cashier for two great brothers; the Stallings. They were opposites in many ways, and I can remember when I worked there after church it was a completely different experience depending on which one of them was working. I vaguely remember one of them as an Alabama Football Fan and the other as an Auburn fan, but I could be wrong about that. Most importantly, one had a Timex Sinclair PC that he let me play with and that he was using to program a game. I was down in Fairhope this week before the 4th. 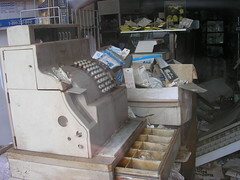 I had the chance to stop by the old place and was amazed to find that the old cash register and other items were still there. Unlike so many local businesses that get swept away by Walmart never to be seen again, this one actually still had its ruins there. As I talked with someone about what these two brothers did for the community, from opening up the pharmacy at 3am for my mom or providing food and drugs on account for the dirt poor family across the way - an account that never got paid --- I thought about how the local Walmart does in fact provide a lot of service to the community. But in the end, it will never be able to replace the contribution of the 100's of other little businesses around this town that it helped destroy. 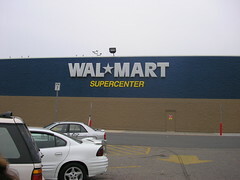 Now having said that; when my son wanted to go get some cheap sunglasses for jet skiing, the Walmart worked just fine. You are right, small businesses can make a huge difference to a town. Their very nature provide more flexibility when it comes to solving problems for their customers, whether it be meds for those who would otherwise be without or basically any other decision. Our ability to set our own hours provides a great deal of flexibility in my husbands schedule when it comes to wiring jobs; he doesn't have to stress about rushing to the next job because someone who has never run cable in their life or who doesn't realize that you can't travel 8 miles during rush hour in Atlanta in less than 45 minutes on a GOOD DAY says he has to be there. Not that I'm biased towards small businesses or anything.